This, nine miles, was my last long run before the Seaford half-marathon next Sunday. My participation in the half is uncertain; it depends on the progress my wife's recovery from a nasty ankle fracture. But I train in the belief that I will be there. And Juneathon starts on Wednesday. It was windy and dull; the hedges showed honeysuckle. roses, elder. There's been sporadic and unfocused running lately, but none of it worth blogging. 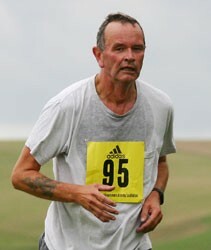 I need to apply myself more diligently, for the Seaford Half Marathon is not far off. Yesterday afternoon's run is perhaps worthy of an entry though. It was a perfect late spring afternoon, sunny and windy. From the top of Seaford Head I was struck by how white everything was: the cliffs of the Seven Sisters, the sheep, the crests of the waves at sea, a whiteness one only sees at this time of year and at this time of day. Looking inland, I wanted to run all evening and all night, across the downs and the weald, all the way to London and beyond. But I had to be home to cook maccheroncini with peas, ham and peppers for supper. I have not returned to the sea yet; any day now. I sometimes feel like this when I swim. I wonder what it would be like to set out, in a line perpendicular to the beach, and swim and swim until my strength was gone.